I’ve traveled to Finland a lot more since moving to Norway than I had expected to. 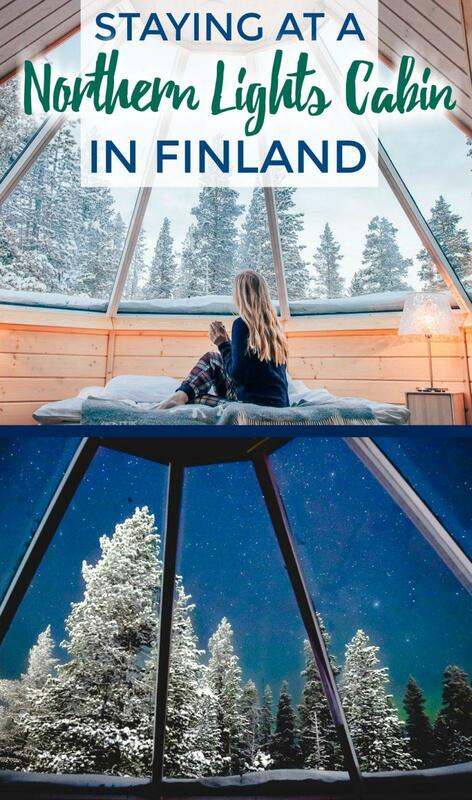 I mean, I’ve always loved Helsinki, but otherwise Finland didn’t used to feature too heavily in my travel daydreams. 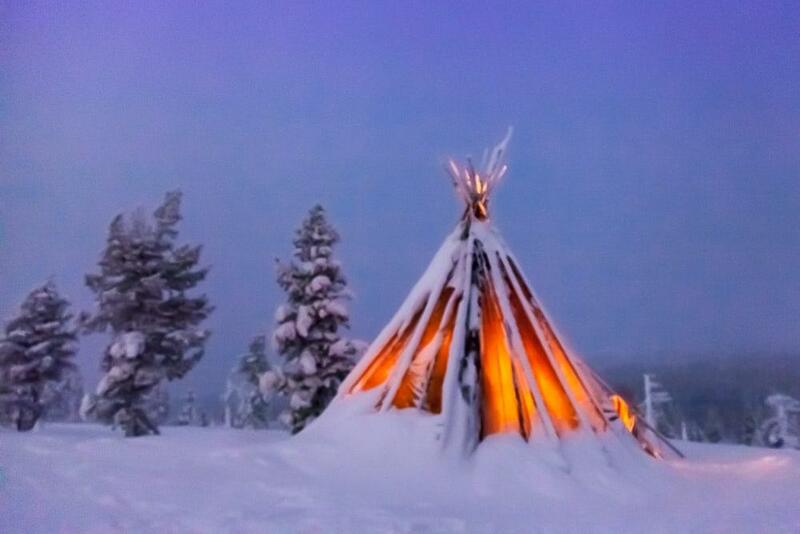 Well, except one place: staying at a Northern Lights cabin in Finnish Lapland. 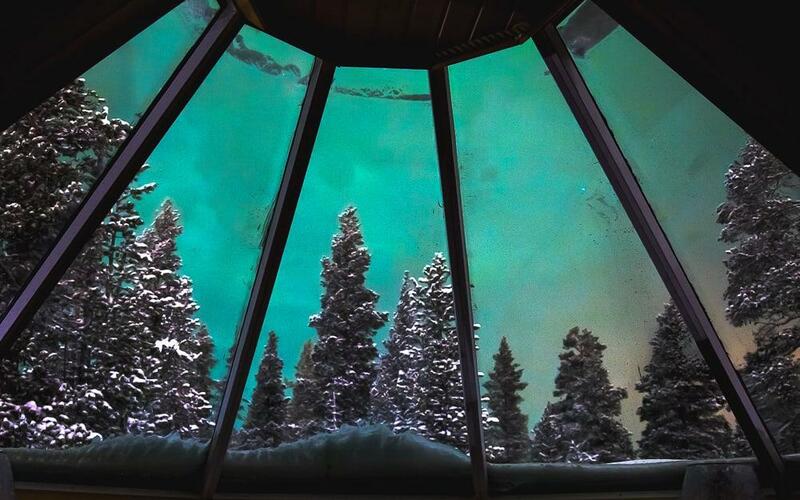 You know, one of those places with a glass roof so you can watch the Northern Lights dancing in the sky from the comfort of your own bed. I have been dreaming of doing this for years. 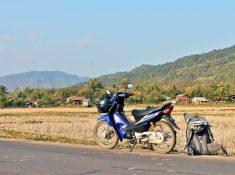 I even got close to planning trips a few times, but something always fell through. 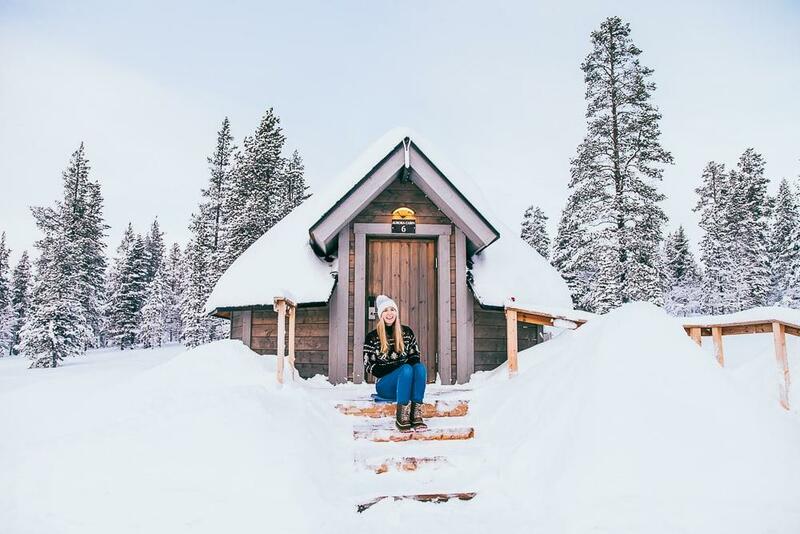 But then as I was booking my flights home from Helsinki for this January it hit me – why don’t I just book a trip up to Finnish Lapland on my own? 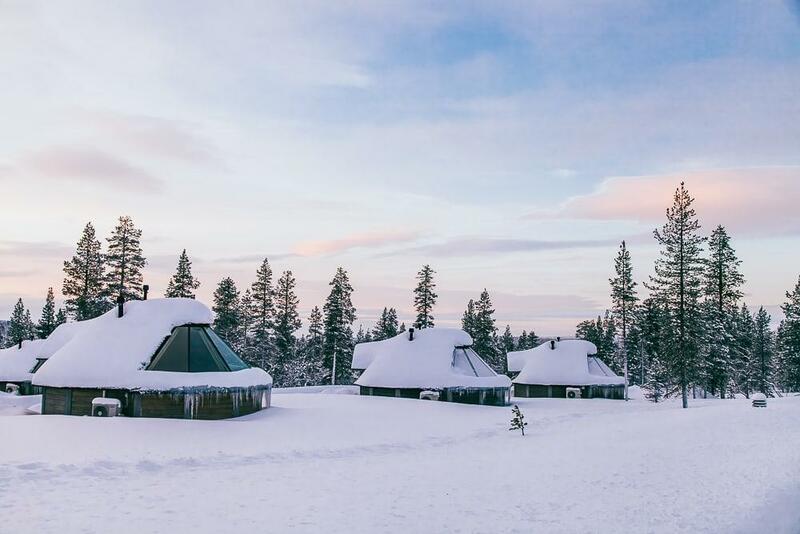 It turns out there are a lot of options for glass-roofed accommodation in Finland, ranging from glass igloos to cabins, and big cities to ski resorts to the middle of nowhere. 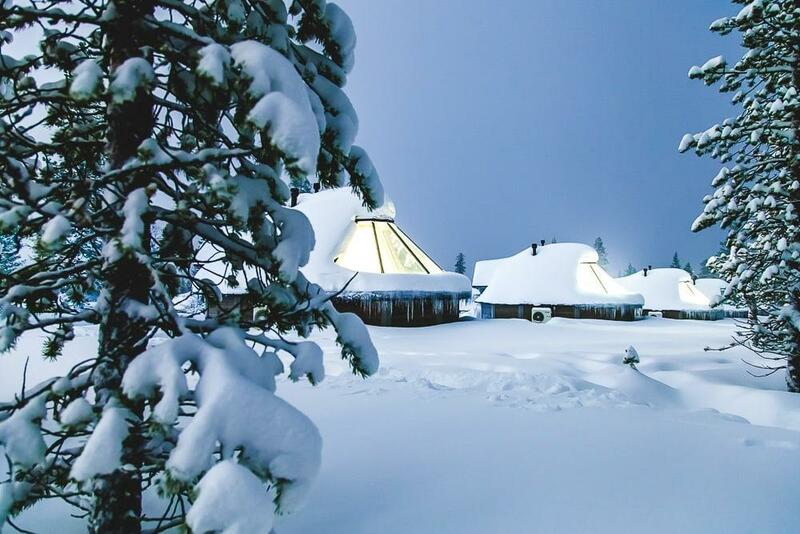 I ended up choosing the Northern Lights Village in Saariselkä – Inari, the far north of Finland. I mostly decided to head to Saariselkä because I wanted to be as far north as possible to have the best chances of seeing the Northern Lights, but I also loved that the Northern Lights Village really looked like it was in the middle of nowhere, and that they offered lots of non-Northern Lights activities as well. Because if there’s one thing I’ve learned chasing the aurora over the years is that it is not at all reliable, so you shouldn’t plan a whole vacation solely around the chance of seeing it. And guys, I think I made the perfect choice. 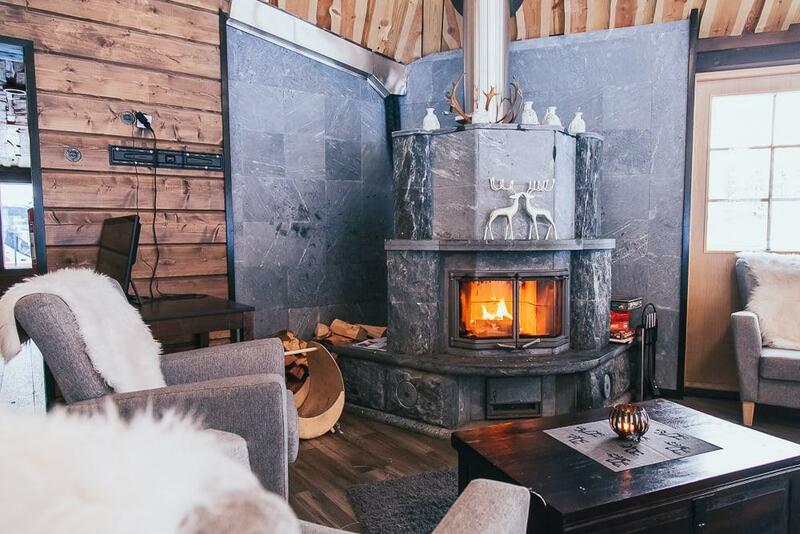 My Northern Lights cabin was so cosy – I still daydream about going back there – the area around Saariselkä is beautiful and also super interesting, and I had so much fun during my days there that there was a lot less pressure to see the Northern Lights at night. Now let’s talk about this cabin. I could not get over how pretty it was! 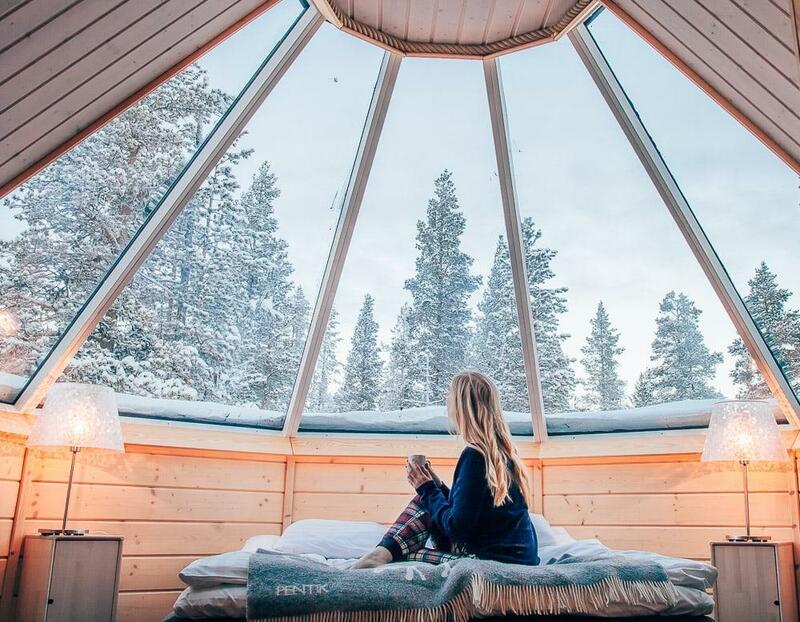 There’s a button you can push to heat up the glass to melt any snow on it, so you’ll always get a clear view of the sky. The first night I arrived the sky was totally clear, and while frustratingly the aurora was too low on the horizon to really see, lying in bed under the stars (so many stars!) made for the most magical night. But like a said earlier, a big factor in my choosing the Northern Lights Village was that I’d have plenty of fun activities to occupy me during the daytime as well. 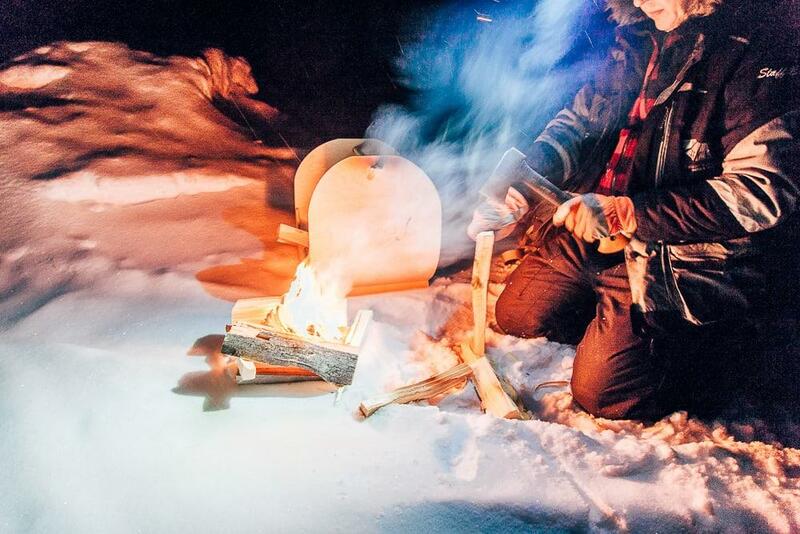 They offer loads of winter activities like snowmobiling, husky sledding, snowshoeing, and hanging out with reindeer. I was really surprised that my favorite activity of all ended up being the snowshoeing! Snowshoeing might not be as flashy as dashing through the snow on a snowmobile or reindeer pulled sleigh, but I think that’s actually why I liked it so much. I didn’t need any fancy equipment (or animals), just a pair of snowshoes and the woods. I went with a wilderness guide from the Northern Lights Village and her friend who works at the nearby ski resort, and we had such a peaceful afternoon walking through the woods and chatting about life in Lapland. We stopped at a kota for some hot juice and cookies, and I loved how totally quiet it was up there. 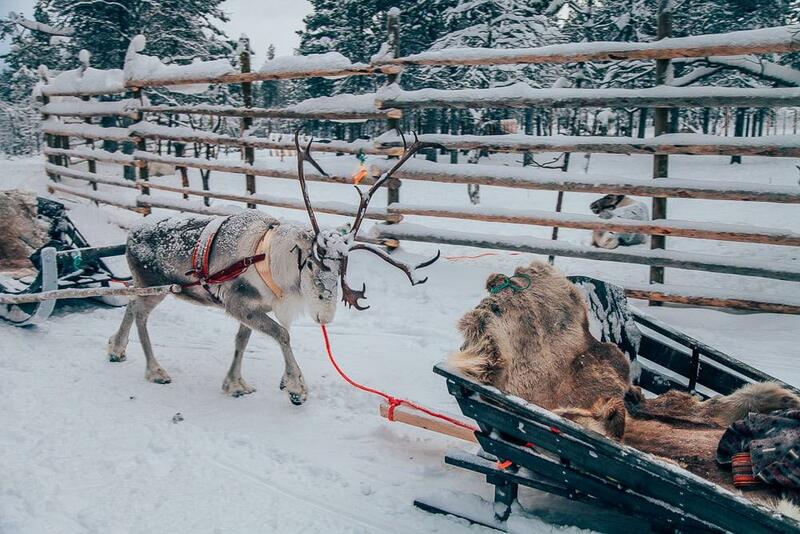 And of course I couldn’t spend time in Lapland without hanging with some reindeer! 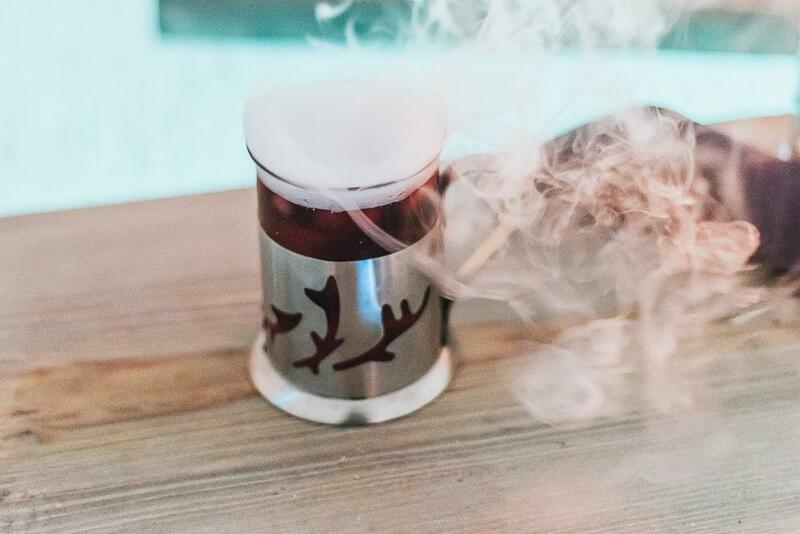 The Northern Lights Village offer a few options for visiting their reindeer, including a four-hour reindeer safari, where you can learn all about the reindeer living here. 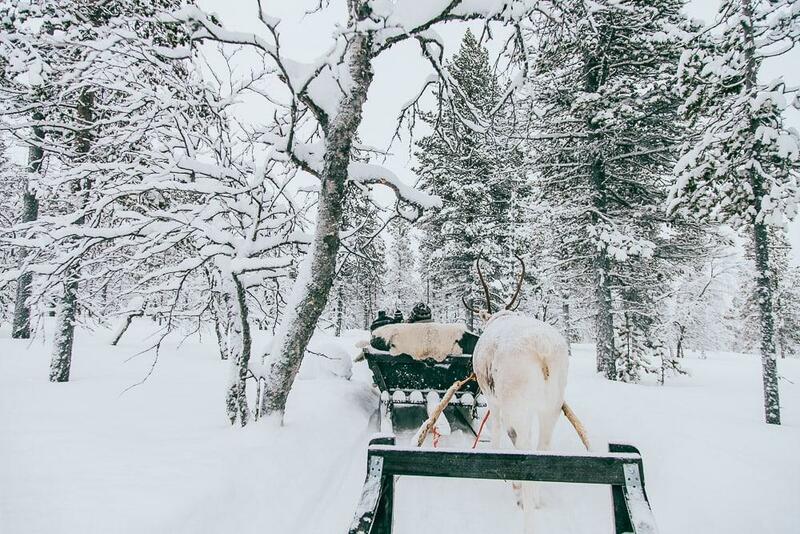 But since my schedule was pretty tight, I instead opted for their “Reindeer Express” – a 25 minute sleigh ride through the woods. Now, I’m always really wary of any activities involving animals (which is a big reason why I’ve never tried husky sledding – though everyone tells me that I shouldn’t worry because the huskies love it), but after talking to the Sami people in Inari, it seemed like taking a sleigh slowly through the woods doesn’t bother the reindeer too much. At least that’s what they told me! And I do want to believe that, because the sleigh ride was so nice and peaceful, and a lovely way to see more of the surrounding landscape. 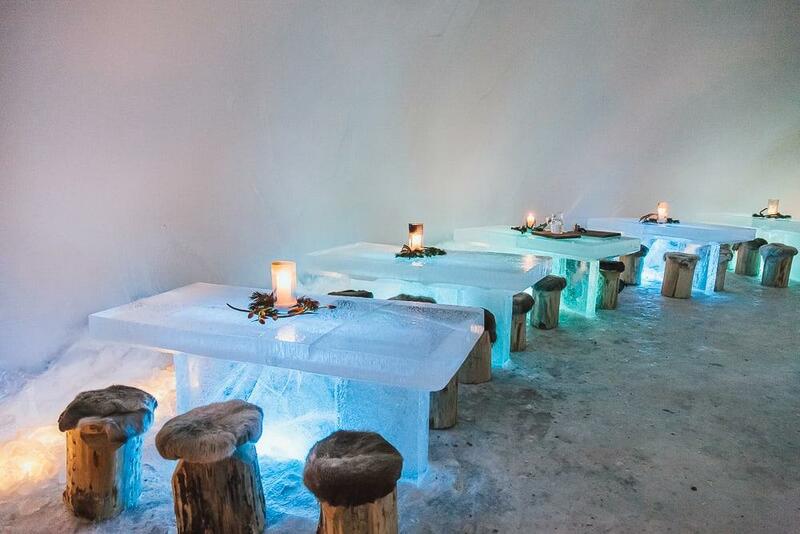 Another one of my favorite experiences at the Northern Lights Village was having dinner in their ice restaurant. I had visited an ice hotel before in Kiruna, and was so amazed by the intricacies of the ice carvings there. 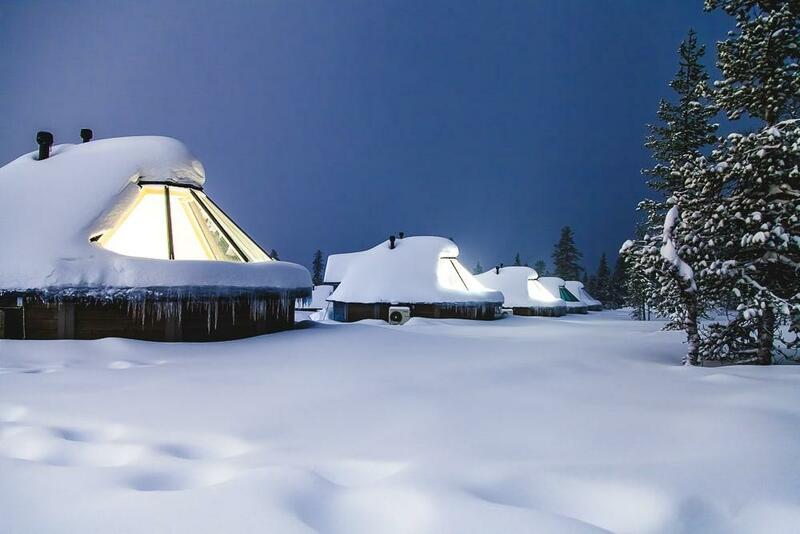 But at the same time, I wasn’t sure I would ever actually want to spend the night inside an ice hotel. But having a nice hot meal sounded much more appealing to me! 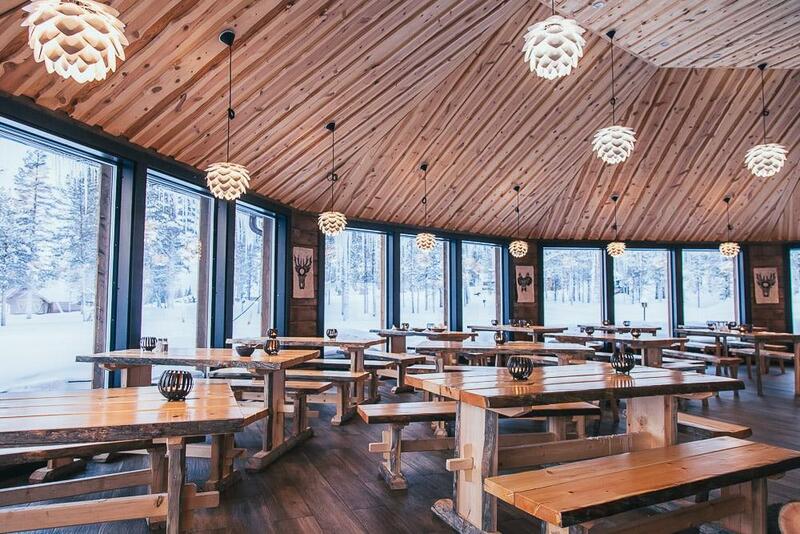 The restaurant itself was so beautiful, and the the seats were covered in reindeer skins so I actually felt quite warm, even though the restaurant is kept at around -5°C. Then again, maybe the restaurant felt warm because outside it was in the -20s! 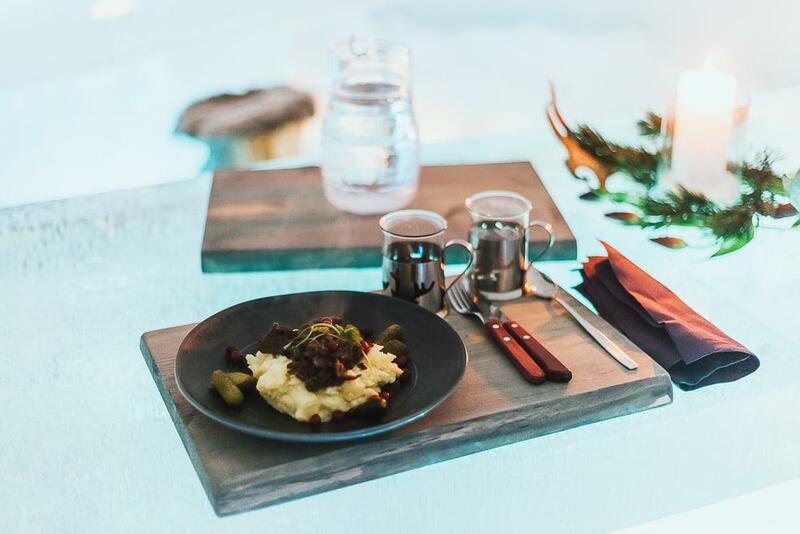 The ice restaurant offers a bunch of different menu options, but I chose a 3-course meal of salmon soup, reindeer with mashed potatoes, lingon berries, and pickles, and a dessert of Cream-braised Finnish cheese with cloudberries. Now, I don’t know if this was because I was so enchanted by my frozen surroundings, but this was hands down the best meal I had in Finland. You can see all the dishes I ate in my video at the start of this post. While the aurora was too far north to see much of on my first night in Saariselkä, my second night promised much more Northern Lights activity. I took the Aurora Hunting by Heated Sleigh tour, where a group of us rode in a little wooden sleigh pulled by a snowmobile out to a dark viewpoint. The sleigh had glass windows but they were too frosty to see anything through, but it was a very comfortable way to get out away from any light pollution for the best chance of seeing the Northern Lights. Unfortunately it was snowing heavily the entire time we were there, so we just stayed inside the kota by the fire enjoying some hot drinks and snacks. But our guide said that we might have a chance to see the lights during the night if the clouds moved at all, so he recommended drinking lots of water so that we would have to get up many times during the night! I’m a deep sleeper so instead set my alarm for every two hours in the night, and sure enough around 3 am I woke up to see the Northern Lights glowing above me. The sky was still very cloudy, but the clouds were moving quite quickly, offering a lot of glimpses of the aurora behind them. I actually found it a bit frustrating though, because clearly there was a spectacular show going on, but I could only catch short peeks! I also tried to take a few photos, but apparently my photography skills aren’t so on point when I’ve woken up in the middle of the night, whoops. 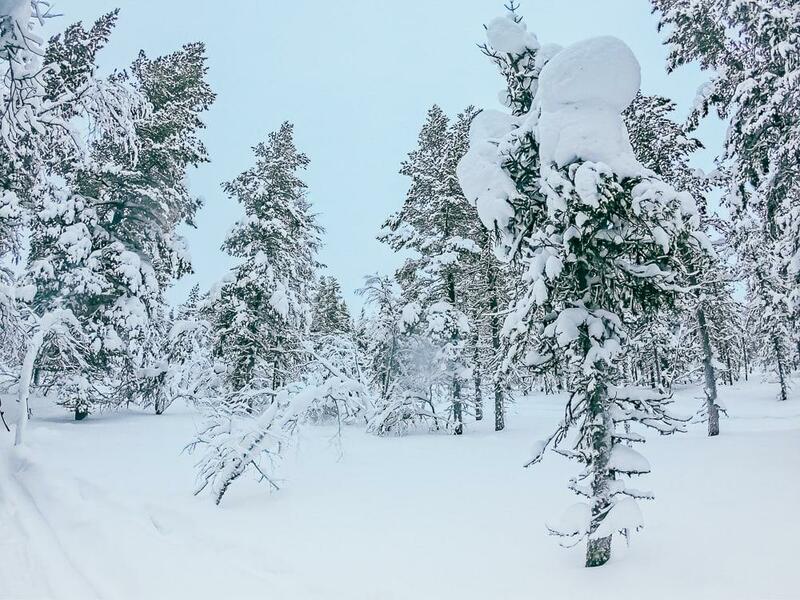 My next and final day in Saariselkä was the snowiest of all, to the point where I even asked my Northern Lights tour guide if it was worth going out. But he just smiled and told me I wouldn’t want to miss this trip. Confident much? Well, it turned out he was right, because even though I didn’t get even the tiniest glimpse of any aurora that night, this was probably my favorite excursion. I was the only person on the Aurora Camp by the Border excursion (probably due to the weather), which meant I could sit up front chatting with the guide on the drive up to the Russian border. He grew up in a Sami family living right in Saariselkä, so had all the insider scoop on the area. So I took the opportunity to ask him about something that had been on my mind since I arrived: that button that melts the snow off the glass roof. I couldn’t stop wondering what sort of toll the hotel was taking on the environment. I mean, surely these individual, half glass cabins must use a lot of energy, right? But I was surprised to hear that actually they are designed to be eco-friendly, and the cabins are even produced in a local factory. Besides chatting with my guide, I also loved looking out the window on our drive up to the Russian border. I’ve been dying to visit Murmansk, so it was exciting to drive right by the turn off to the city, and to hear all about it from my guide, and then we drove right up to one of the old border crossings. Driving on the old road to the border (which is now a dead end) really felt like we were headed into the middle of nowhere. 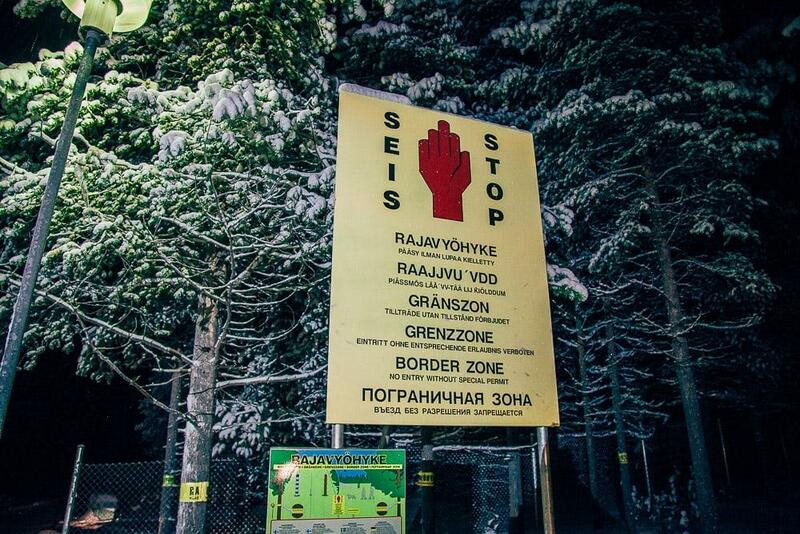 This particular border is now closed, and the facilities were turned into a retirement home for locals! So bizarre. After a half hour of waiting for the skies to clear we drove down to Lake Inari to try our chances there, but it was still snowing. 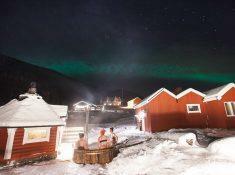 You can check prices and availability for the Northern Lights Village here. Both a breakfast and dinner buffet is included in the price of the stay. I really enjoyed the food selection, which featured some local specialties as well, and the restaurant area was always an inviting place to hang out when coming back from a day out in the snow. 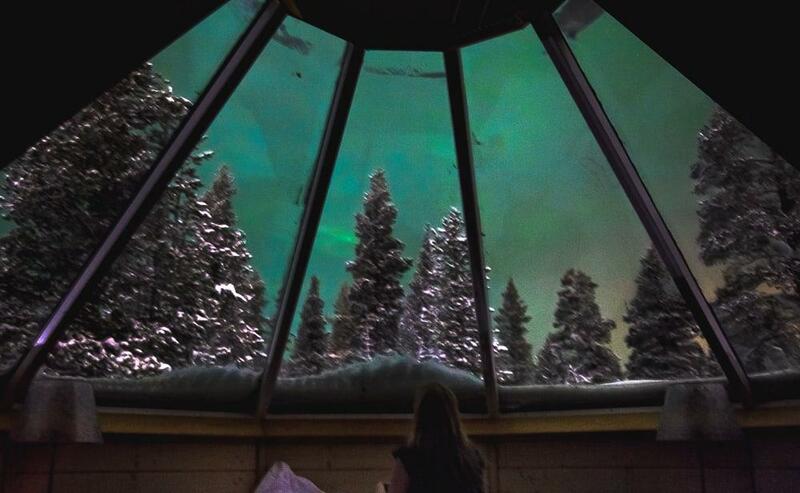 The Northern Lights Village is open from the end of August to the end of April – basically the entire time when it’s still dark enough to see the Northern Lights. I asked a lot of the staff when they thought was the best time to visit, and I got a lot of different answers! Some people said to come in the early autumn, when the weather tends to be good and, at least in the past few years, there has been a high amount of aurora activity. I also heard that watching the aurora over Lake Inari is spectacular when it’s not frozen, as the lights reflect off the water. 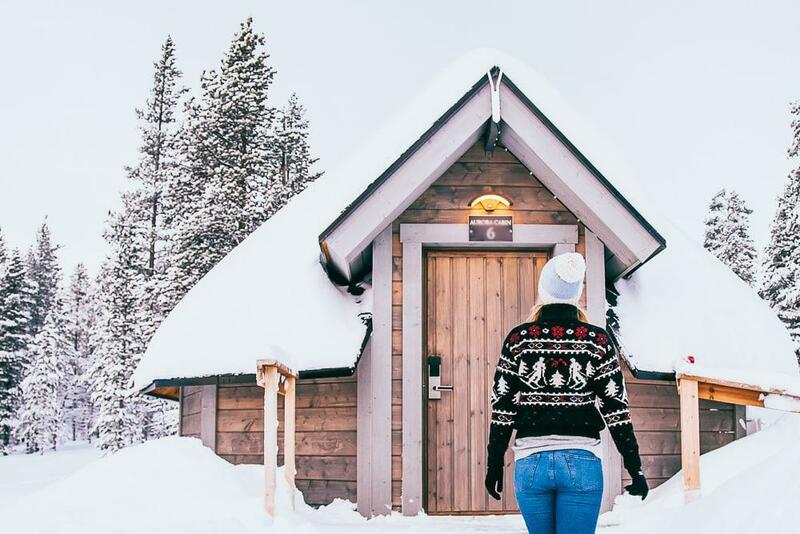 Some said they love the area around Christmas as it’s so festive (plus, Santa lives in Finland), whereas others said that they’d rather avoid Christmastime as it’s so crowded. Apparently the hotel can also get quite crowded around the Chinese New Year. Someone said that I had chosen the best time to visit – the end of January – because the days are starting to get a bit longer but it’s one of the quietest times at the hotel (in fact I was the only guest on several of my activities and excursions). But then someone else said they’d prefer to come a bit later in the winter, when the weather is better and the days are a bit longer – I guess it would depend on whether you want more time to see the Northern Lights or more time to enjoy the outdoors in the daylight. So basically it sounds like you could have an amazing time regardless of when you visit. But personally I was really happy to have visited in January because I loved how quiet it was, plus I do (weirdly) enjoy the really cold days of winter when the trees are extra frosty. 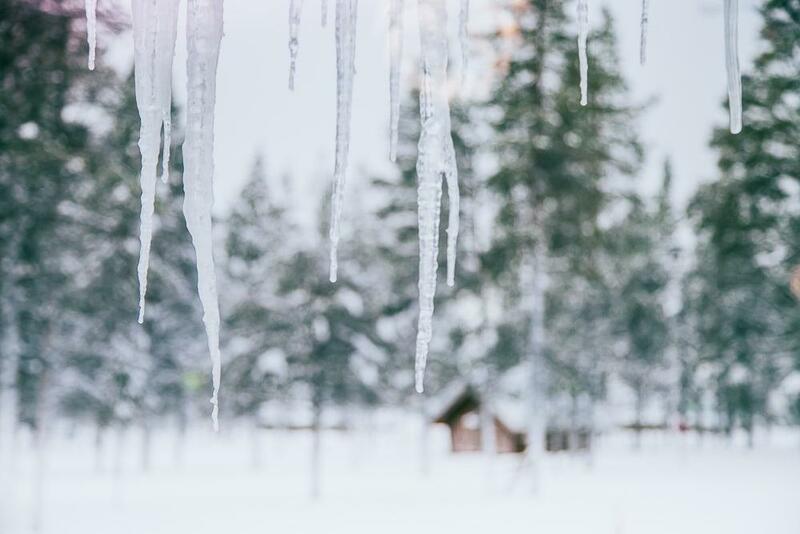 If you’re wondering what to pack for a trip to Inari, I’ve written my packing list for winter in Finland here. 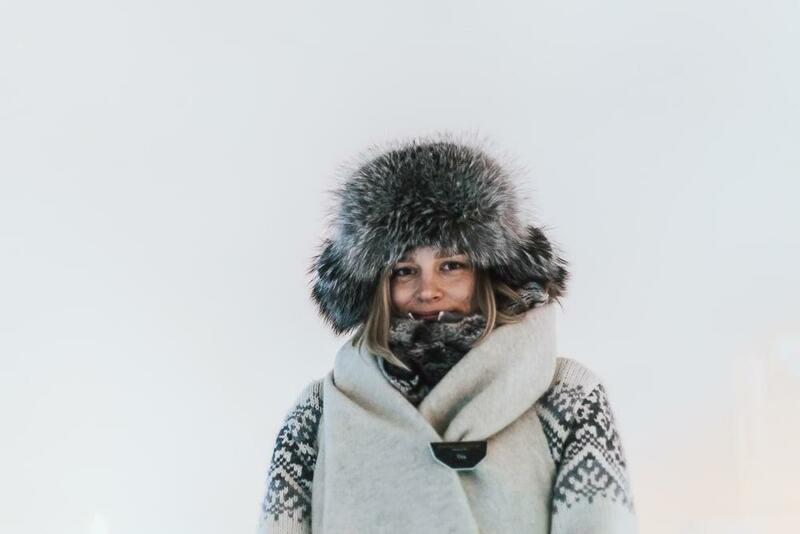 You can also take a look at my guide to packing for winter in Norway, as the climate is the same. 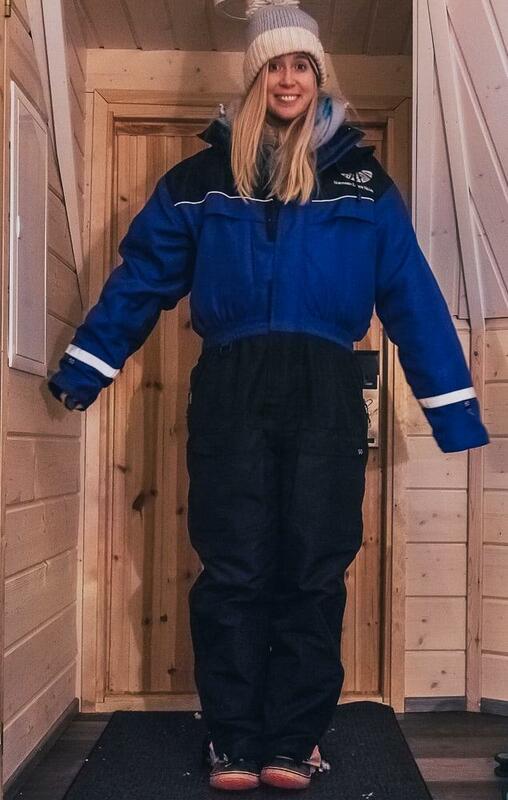 And don’t worry if you don’t have a super heavy duty parka or boots – the Northern Lights Village provides a warm snowsuit, mittens and winter boots for you to wear on all of your activities with them. They’ll make sure that you don’t freeze! 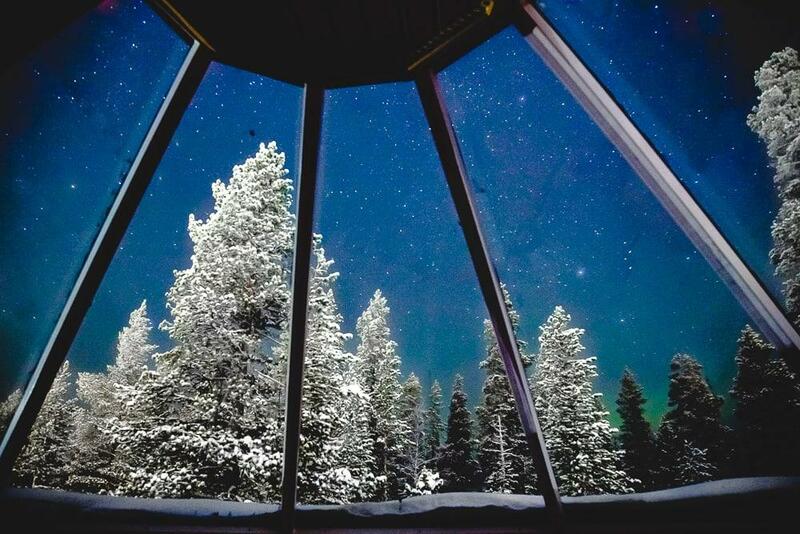 I was a little unsure of how weird it would be to visit the Northern Lights cabins as a solo traveler, and while the staff did say that they don’t often see travelers on their own, they also said that it’s not just a trip for couples on their honeymoon as I had feared. I mean, it is a really popular honeymoon destination, but they said they’re seeing more and more groups of friends splitting cabins together. I mean, what better friend holiday than getting to play in the snow by day and hunt for Northern Lights by night? Plus as these cabins are quite pricey, it’s the perfect way to cut down costs. But if you don’t have anyone to go with, just book it yourself! I had an amazing time there, and I suspect I got to know a lot of the staff much better because I was traveling on my own. 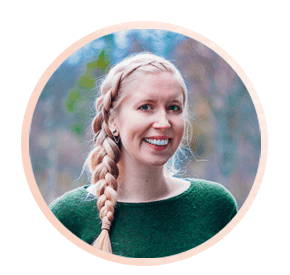 In fact when I got home and started telling Dan about my stay at the Northern Lights Village, the first thing I raved about was how wonderful the people there were – which is really saying something, considering how amazing the hotel itself was! Everyone was super friendly and they have a really great community of young wilderness guides, which made for a fun atmosphere. What a stunning site to see! To have windows that go all the way to the roof line to create such a view is a great idea. That’s a memory to last a lifetime! Aww! The glass igloo looks so cute. And even though I love winter and snow, I wouldn’t mind watching the snow melt and the Aurora come out in the middle of the night through the safety of my fluffy socks, hot toddy and squishy blanket! This is so amazing and the photos and the video have completely convinced me that I must have this experience now! 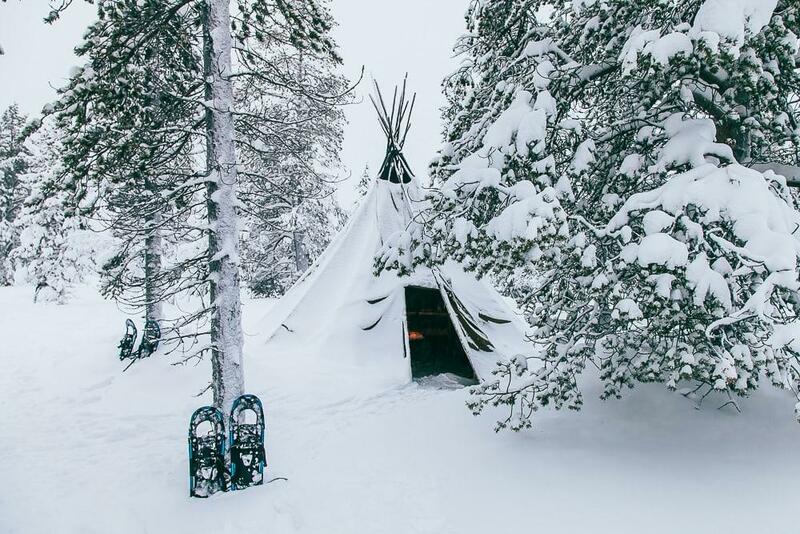 I miss the snow (being from Canada) and this looks like my kind of trip, and the ice hotel and reindeer ride! I had never considered doing this until I saw your post. It looks like such an amazing experience! It’s seriously so worth it – I loved my stay there! This looks amazing!! Are there opportunities to downhill ski nearby (including backcountry skiing)? I know Finland doesn’t have the mountains that Norway does, but I would love to do a trip combining the Northern Lights with skiing. By the way, I would love to read a post on how you’ve learned languages – which ones you studied in school, which ones you studied later, which tools/courses you’ve used. It sounds like you’ve studied some pretty tough ones (Japanese, Russian), so it would be great to hear your tips and tricks! I literally just texted two friends sending them this article! 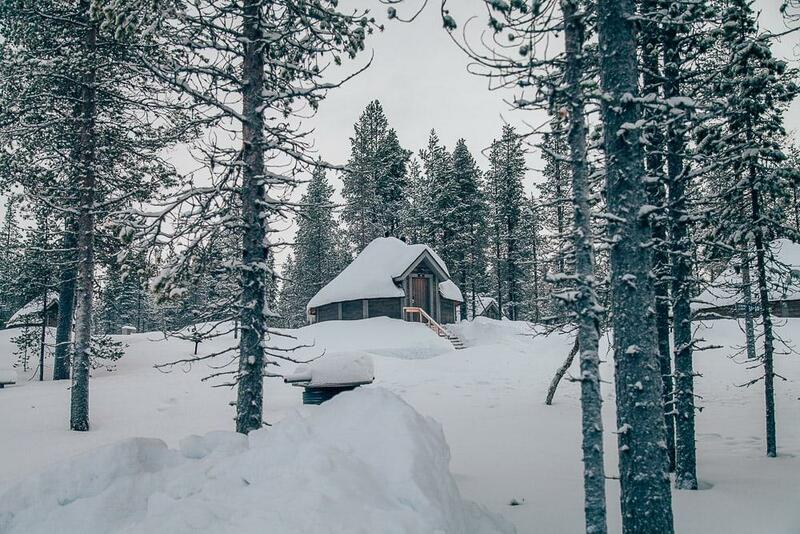 We need to plan a trip here next winter. Interesting that you said autumn can be a good time to go for stronger lights. Is there a better chance of seeing them then? Though I think I’d prefer to go in January like you did for the full winter experience. 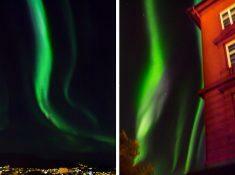 Some people say the Northern Lights activity is higher in early autumn, though it’s hard to predict! I loved visiting in January though, and can definitely recommend it. 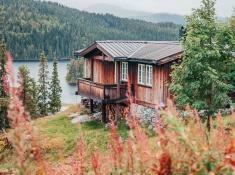 That cabin looks so cool and pretty! Looking at the website though, I can see why people save it for a honeymoon, cause it is quite a pretty penny. They better give you a snow suit and books and whatnot, is all I’m saying, haha. I want to go too! Dreamy… Also: hee hee, ‘boots for you to where’ ;).